We walked the shoreline one morning last week looking for shells that were worth keeping. The tide was out, so the sandy part of the beach seemed massive. Yet few shells seemed colored uniquely or shaped wholly enough to put in the plastic buckets. He found broken pieces of shells with different colors. He gathered small shells that were perfectly shaped. He wanted pieces that looked like they could be images of animals – you know, like when a kid interprets the clouds’ designs. Just because a shell was broken didn’t disqualify it from Ben’s bucket. Usually one to be where the party is, Ben wandered more slowly than the others or detoured from the group. It was then when he discovered treasures. We were on a morning walk on the beach, gathering natural souvenirs. But God met me there, cueing Ellie Holcomb’s song called “The Broken Beautiful” as the soundtrack for the moment my heart needed to soak in. Ben was right. It didn’t matter if the shells were whole because even the broken pieces had beauty. Our lives are the same way. None of us are whole. But we’re holy. We’re set apart, which sometimes means we venture away from the crowd. We all have our own damage and hurt and disappointments and fears. But over time the tides ebb and flow, washing away the jagged edges and making the fragments smoother. Like my boy with his shells on the shoreline, God gathers up all the pieces of our lives, knowing they’re worth keeping. Yes, some are pointy and others are dusty, but God covers them all with love and grace and compassion and mercy and forgiveness and peace. With this post, I'm joining the weekly Soli Deo Gloria Gathering, where brokenness is believed to be beautiful. "None of us are whole. But we’re holy." Yes! Love this, Kristen. I'm encouraged knowing that my broken pieces are still being gathered and kept and used. 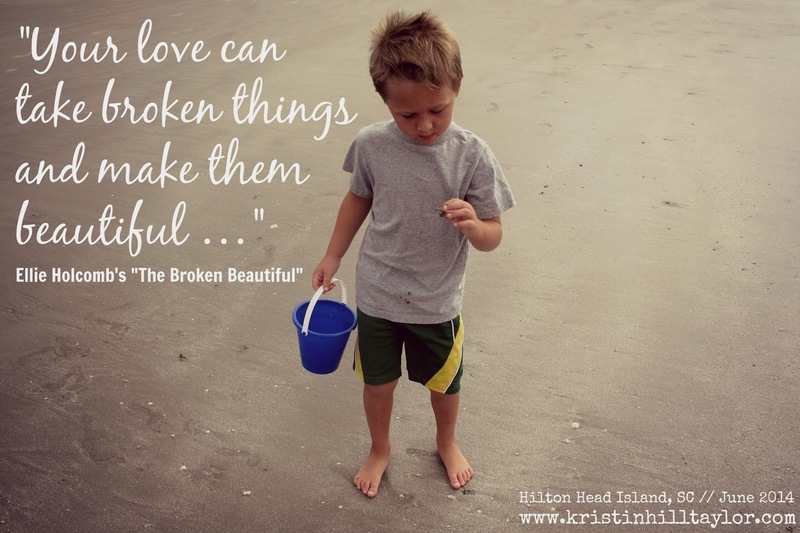 Listening to "The Broken Beautiful" -- love that song! It's a favorite song around here. I couldn't get enough it that day watching my boy collect imperfect shells. Thanks for coming by, Lisa! Broken shells - we've been in the same place friend - and found rich God messages in them. I miss those little boy walks! Like broken shells made whole by a loving God we are! It was such a neat moment between me and God - probably because I wasn't expecting it. :) Thanks for reading! Just read your adoption story on SDG and now this. God keeps reminding me to see beauty in my broken perfection. I'm not whole but I am holy. What a powerful reminder. Love your picture in the header too... When I realized it was the sweet Cate and Ben I'd just read about, tears. again!